Few people like alarm clocks, but just about everyone's got one. If you have a job, if you have a life, if you have responsibilities, you probably use an alarm clock to wake you up and help you start your day. Clocks go way back, almost as far as humans, and alarm clocks weren't far behind. In fact, clocks and time-tracking devices are so old that no one really knows when the first was ever used. The first use of an alarm for waking is recorded as circa 250 BC. The ancient Greeks created a 'water clock,' which is a device that incorporated rising waters that would keep time and eventually hit a mechanical bird that triggered a whistle to blow and wake its user. Thankfully, today there are much more sophisticated, not to mention stylish, means of beginning the day. The non-electrical as well as the electronic components of alarm clocks have greatly evolved, offering many options to arrest slumber. Some of the original technology of early clocks still remains. Most clocks of the modern world belong to one category or other of analog or digital. Occasionally, you may find someone who still uses a water clock or even a sundial, but it's doubtful anyone using such a device cares much about the passage of time or getting anywhere by a specified hour of the day. The reason for this is that today's clocks offer more options, control, and designs. If you're going to rely on your alarm clock to keep your schedule for you, then it won't hurt to know a little about how these helpful gadgets work. Sundials are considered to be the first analog clocks, but you're probably not going to use one to wake you up. The first analog alarm clock is recorded to date back to the 1500s, with the first patents being awarded in the late 19th century. Though it looks pretty simple, the analog alarm clock is more complicated than it seems. An analog clock is usually an oscillating clock with a face indicating 12 hours with two hands, one for the minute, as well as one for the hour. An alarm clock generally has a third, shorter hand that is used to indicate time to be awakened. Inside the clock are gears that are fueled, typically, by either electricity or batteries. When this source of power is added to the clock, the gears move, turning the hands, and an oscillating wheel mechanism keeps the time consistent. (Though there are analog clocks that use electronic components to control the hands, most use gears.) As seconds pass, the wheel chain synchronizes seconds, minutes, and hours accordingly. In an analog alarm clock, two metal bells sit on top of the clock with a small hammer-type instrument in between them. The third hand is controlled by a knob that winds it to point to the desired wakeup time in order to 'set' the alarm. This process sets a spring within the clock which then presses against the mechanism of the bells and hammer. When the set wakeup time is reached, this process trips the spring which releases the tension and makes the hammer to vibrate against the bells. This culminates into, as everyone who's ever used an alarm clock in order to be somewhere at a certain time knows, a very loud sound that can startle and awaken even the deepest of sleepers. A digital alarm clock displays the time digitally using electronic components instead of using hands, springs, and gears. Instead of the oscillating wheel, the digital clock uses an electronic time-base that counts off the seconds, keeping time accurately. In place of the analog clock's gears, the digital clock uses a counter and an liquid crystal display (LCD) or a light-emitting diode (LED), which is a two-lead semiconductor (material that conducts electric current) light source. Digital clocks rely heavily on electronic parts such as capacitors and resistors, as these devices manage the flow of electrical current. When the clock reaches the desired time, rather than using bells and hammers, a noise or radio is sounded. Humans have used clocks likely since before recorded history. 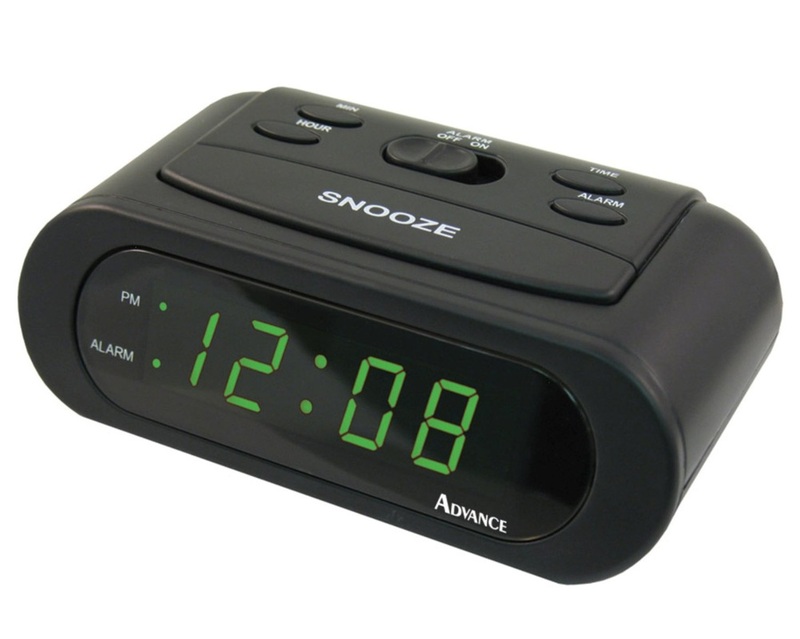 Both analog and digital alarm clocks have become a vital part of modern society. Whether you choose the old-fashioned clock with a face and hands, or one of the more state-of-the-art digital models, you probably rely on an alarm clock to help you start every day off right.